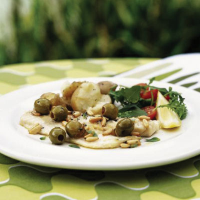 These moist Greek sea bass fillets are pan-fried with garlic, olives, oregano and lemon juice for a really quick and easy supper dish. Lightly season the sea bass fillets. Heat 1 tablespoon of the olive oil in a non-stick frying pan, then add the fillets skin-side down and cook for 2-3 minutes or until the skin is crisp and golden brown. Turn over and cook for a further 1-2 minutes, until the flesh is opaque and just cooked through. Remove from the pan and place on warmed serving plates. Add the remaining tablespoon of oil to the pan and cook the garlic and pine nuts for 1 minute, until starting to lightly brown, then add the olives and sauté for a further minute. Remove the pan from the heat and stir in the lemon juice. Let it bubble for a minute then sprinkle in the oregano. Spoon the sauce over the fish and serve immediately with boiled and slightly crushed new potatoes, and a roquette and tomato salad. To serve 4 people, simply double the quantities given above.